We love getting lost in our little worlds of play together. One of my favourite things is creating set ups to play. It's such an opportunity to get creative, which we rarely get as adults. I love letting our sensory kiddos take the lead. It's when I hear the best social communication, imaginative ideas and is a little insight into how my foster kids are doing emotionally. Below you will see some small world set ups we have created recently. We have even more ideas on our Instagram feed and Pinterest board. We purchased this wonderful sticky tape road from Amazon. It sparked my imagination enough to create this city play. I turned used cereal boxes into skyscrapers and our favourite shops. 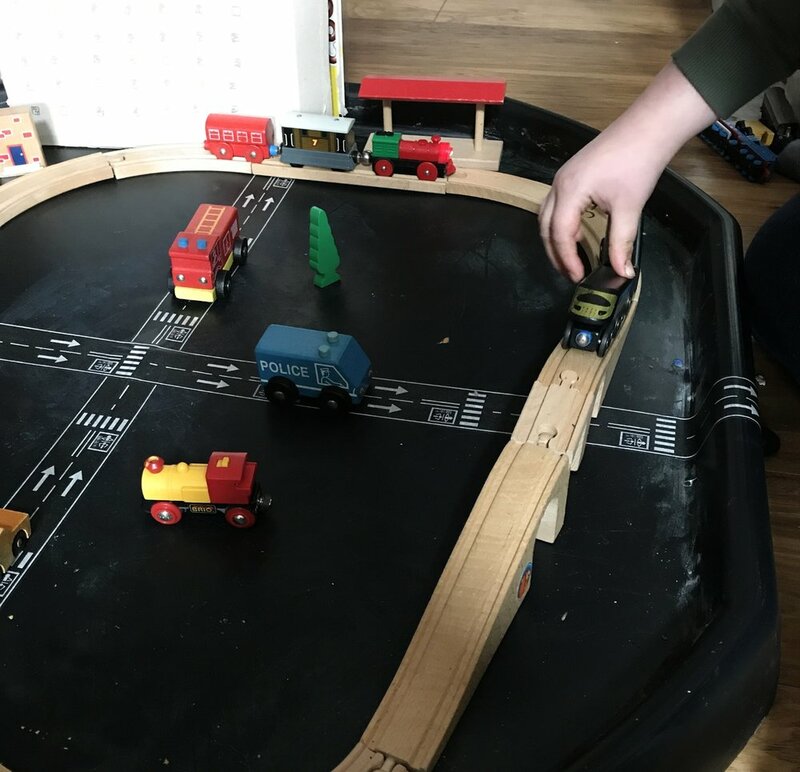 I then recovered my old childhood Brio train track to add to the city. It was great seeing the excitement on my child's face to play with it. He kept going back to it throughout the day and creating different scenarios. Truly great for supporting boys to create stories and imaginative play ready for writing. Also great for language development. I would say 'This train is fast' and see if the children understand my description by how they move the train. We can also count the carriages and describe the colours and shapes. Endless opportunities for play. We attend our local forest school every week. On this particular week we were scavenging loose parts that we found along our walk. They included acorn shells, moss, twigs, gravel, bark chippings...etc. 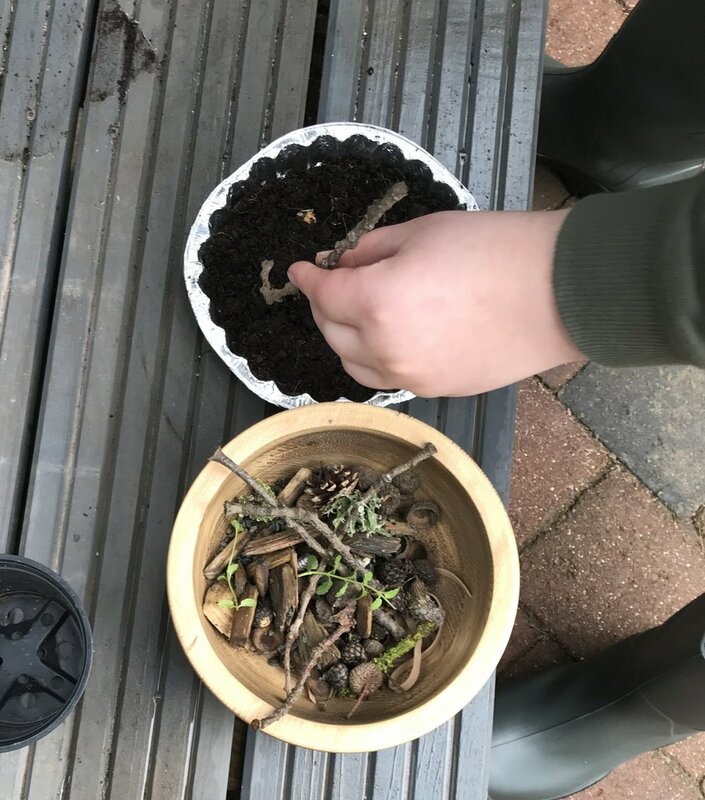 As we were collecting the bits I remembered creating a Fairy Garden when I was little and thought I could share this joy with my foster child. He was so excited and had lots of his own ideas too. 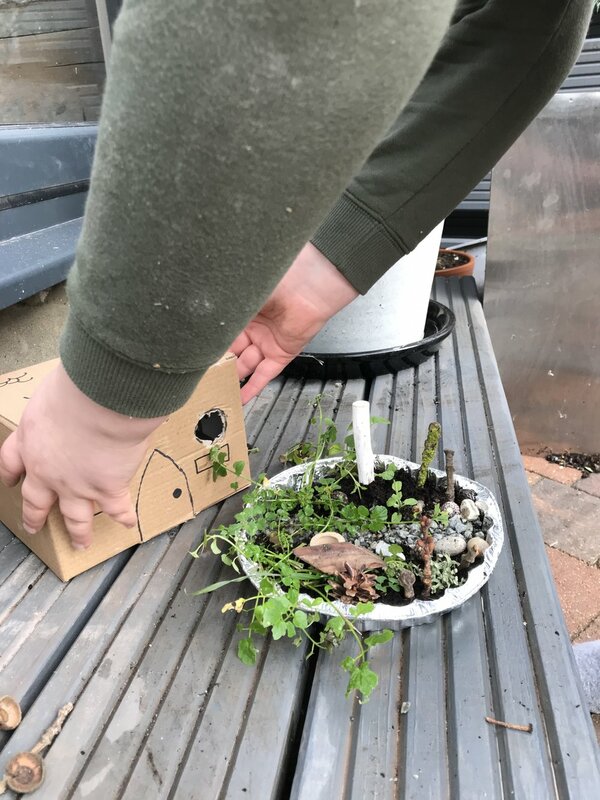 We started by finding a foil tray from our recycling bag and filling it with soil. We made a gravel path and added some greenery. Just then we heard a knock on the door. It was a postal delivery of the best kind! 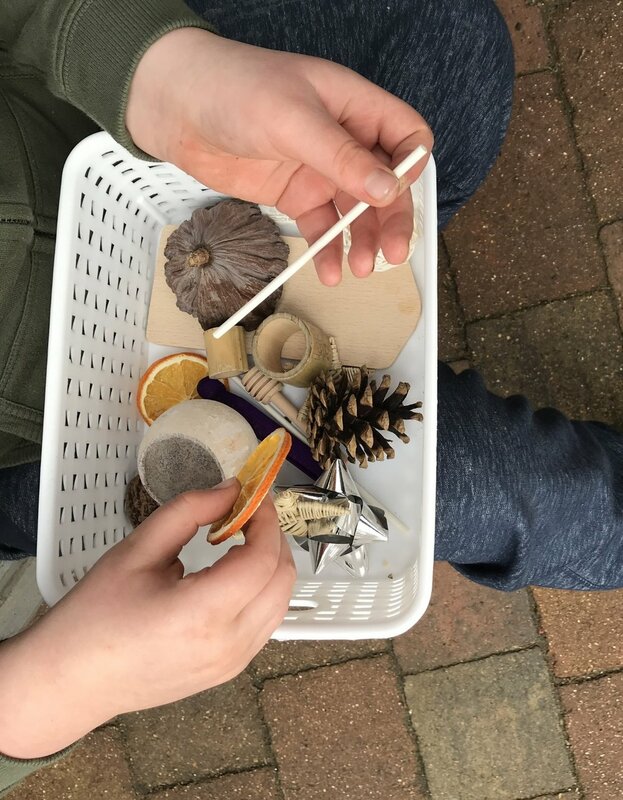 @melodiestreasures gifted us this beautiful basket of Montessori materials (see above), we included them immediately in what we were making. We used the bamboo tubes for seating and the wooden sticks for trees. Of course every Fairy Garden needs a fairy house to go along side it. That will be our next project. For now we are going to keep our eyes peeled on walks for anything else we can add to our garden. Even though it takes lots of time and energy to create these beautifully perfect set ups to play, it is important to remember not to be precious about them. Try to turn off your OCD tendencies and just go with their game. Letting them take the lead is the best way to get the most out your small world play. This way our sensory kiddos will be more engaged and motivated to play along. 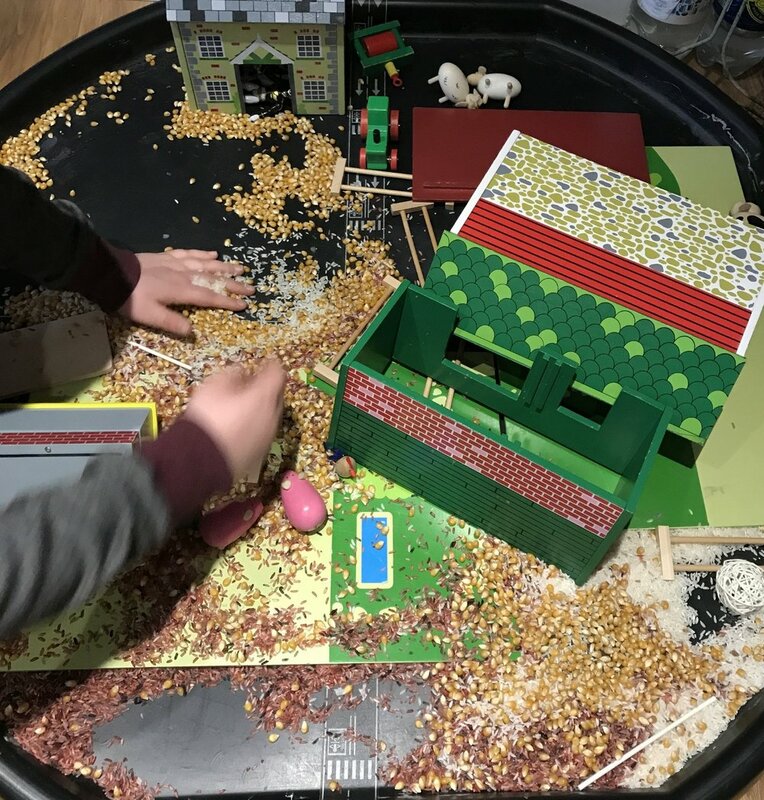 You can see from the photo on the right that my sensory kiddo wasn't as keen on the cute wooden farmyard play that I had in mind, instead choosing to play 'power ranger earthquake' instead. You know what, I got more language, more engagement and far more interest by just going with it. In the end I realised that I preferred all the materials muddled up in his chosen corner and I also preferred his lay out of the buildings. Take my advice when it comes to small world play. Set some basic ground rules, then let them take the lead. I promise you won't regret it. The point is you don't have to purchase or even go out looking for small world play parts. Sometimes is a partly broken and very old pirate ship that has been forgotten about at the back of the cupboard. Your child has either forgotten about it or, like mine, doesn't really understand how to play with it in a conventional sense. 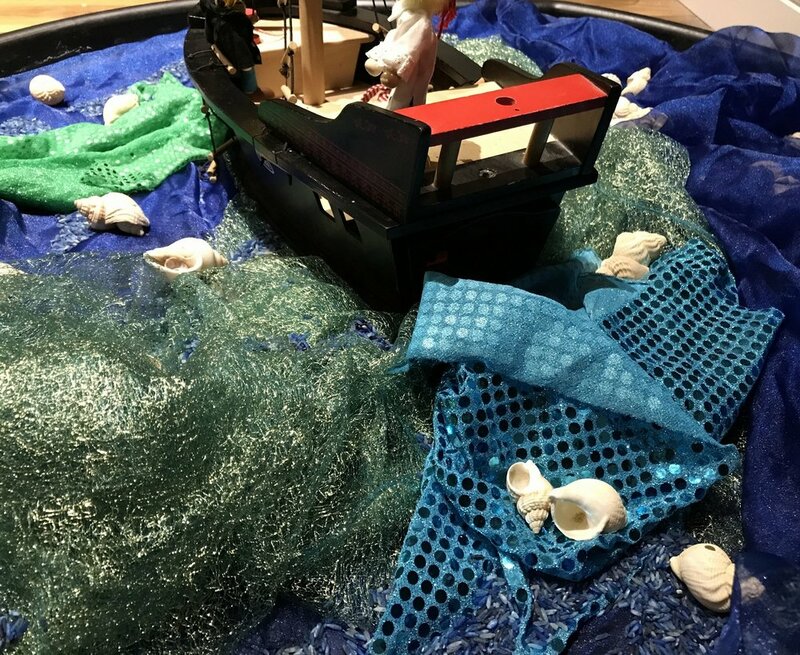 By creating an exciting and inviting display you are transforming an old toy into part of a world. A world that is engaging for our sensory kids. Just by exploring the materials around the toy, they can take part in play. You, as the adult, can take an interest in what they are interested in. In this case it could be the shells, or the rice, the shiny materials or the pirate figures. Find the game with that object. It could be throwing the materials in the air so they land on your heads, or it could be adding voices to the characters and creating a scenario. This is not up to you and your ideas on play, it is totally up to your child. Let them take the lead. For us, our play is always a 'disaster' scenario. The world hits bad weather or a natural disaster usually and everything gets destroyed. We act out the characters and the objects getting tossed and turned, all of the materials in tray are muddled up. We then usually end our play by setting out the world in a new way as the weather goes away. Totally taking his lead. There is no right or wrong way to play. 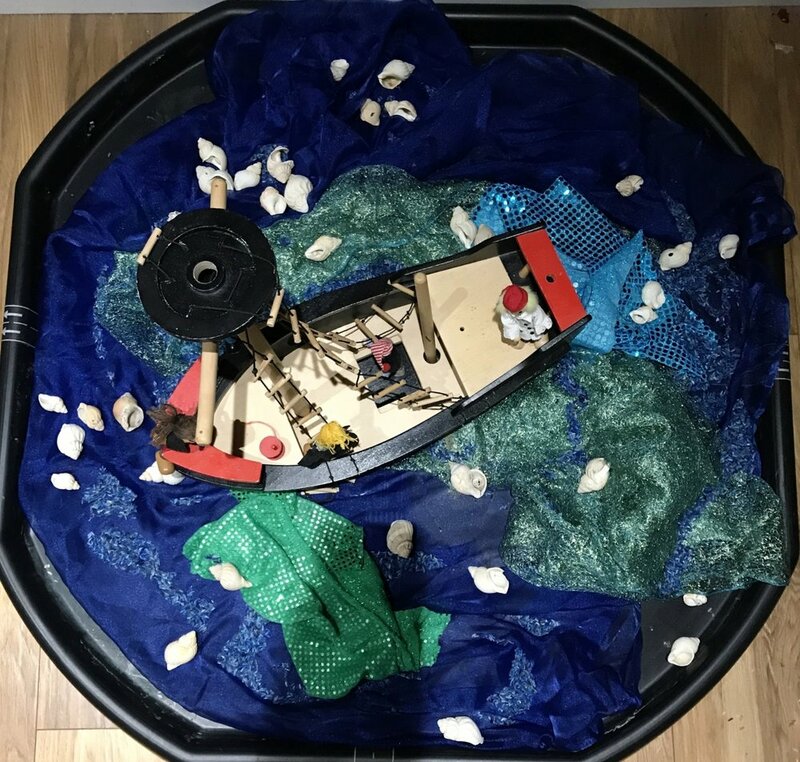 Have fun creating your small worlds, we would love you to share them with us using our tag #osk_smallworld over on Instagram.